In a sign of the continuing strength of private aviation Executive AirShare has expanded operations to four cities and assembled a fleet of 12 aircraft and 20 pilots. 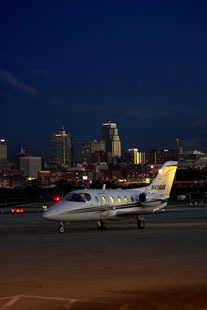 The fractional aircraft company serves owners in Kansas City, Mo., Wichita, Kan., Tulsa, Okla., and Ft. Worth, Texas. The fleet includes two Beechjet 400As (Pictured left and below), four Super King Air 350s, five King Air C90Bs, and one Beechcraft Baron. 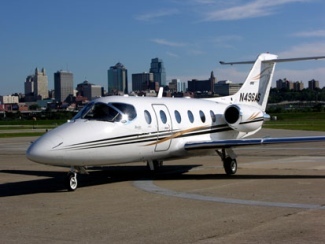 Unlike most other fractional aircraft companies, Executive AirShare's owners are provided with the use of the aircraft for an entire day. This allows for complete flexibility and convenience when an owner's intraday travel plans change. "We don't want our owners to feel like they are part of an air taxi service," said Founder and Chief Executive Officer Robert D. Taylor. Executive AirShare owners pay for an initial share in the aircraft, monthly fixed costs, and low-cost hourly operating rates. In return, owners are given a set number of days and flight hours in which they may use the aircraft annually, and Executive AirShare takes care of all the details including hangar rental, insurance, pilots' salaries and training, fuel, engine and airframe maintenance, and cleaning and stocking of the plane. Executive AirShare owners can interchange to any aircraft in the fleet, providing the flexibility to use the best aircraft for the mission. Although Taylor added "The major advantages of our regional fractional ownership concept are that owners fly in their own aircraft the majority of the time and they know the pilots that fly their airplane." Pricing is based on occupied days, rather than on the number of hours. So a 1/16 share (equal to 18 days) in a Beechjet 400A has an initial price of $293,000 then a monthly fee of $2,725 and an hourly rate of $1,915. The company is based at Charles B. Wheeler Downtown Airport in Kansas City, Mo., and also operates from Mid-Continent Airport in Wichita, Kan., Richard L. Jones, Jr. (Riverside) Airport in Tulsa, Okla., and Meacham International Airport in Fort Worth, Texas. Other options for private aircraft travel include air charters, charter cards and jet cards.